An actress and director, PANG Eun-jin presents Perfect Number (working title). Different from the original mystery novel, she put emphasis on the elements of melodrama. She hasn't lost any of her skill at pushing actors' acting abilities to their limit. -The original novel and its Japanese filmed version both focused on the mind game between the two men, but you didn’t. Why did you put the stress on the relationship between Seok-go and Hwa-seon? The Japanese film already cinematized the original story, so I decided to do it differently. In the original story, the relationship between Ishigami and Yasuko is not mutual but one-sided. It is an abnormal relationship because the emotional passage is cut and blocked. In Perfect Number, Hwa-seon realizes that he loves her and she slowly opens her heart and accepts him. Their love is disturbed in the middle, but finally they somehow protect the relationship. I would say melodrama is the backbone of the film. While Ishigami was cold, logical and intelligent in the previous works, Seok-go in Perfect Number is rather a warm-hearted man. -The film looks very still and calm all the way, so it made me think that all the details including shooting, lighting, music and editing were very delicately handled. I didn’t do it alone. I discussed with the director of photography CHOI Chan-min and the lighting director LEE Cheol-oh before drawing the continuity to share opinions about the details, even whether to have the light in a corner on or not. I paid particularly attention to lighting, so I had to wait pretty long until the lighting was set up. One day during the winter, I was shooting an outdoor scene and the lighting director had been in the freezing weather for 3 hours setting up for lighting. Whenever I gave a direction saying, “Cut and Okay!”, at the first take, he would ask me back right away, “Is it Okay again?” and had to go back to set up for the next scene. 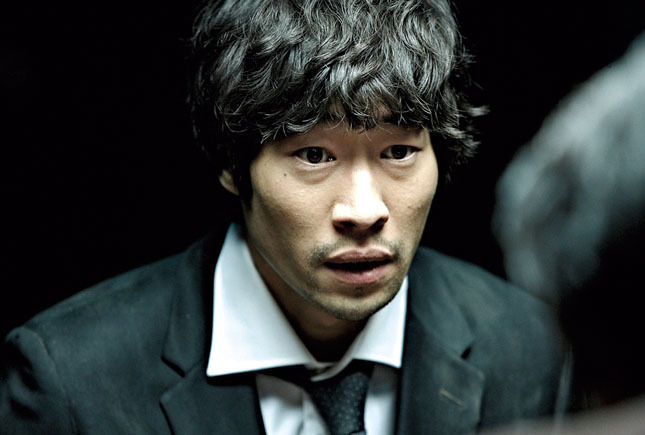 -RYOO Seung-bum, who has played bright and cheerful roles, seems new in a melodrama film. It felt unusual when I saw him act in a calm manner. Especially the scene in which he shed sad tears was something I had never seen before from him. He spent his twenties playing in films like Waikiki Brothers (2001) and Conduct Zero (2002) after he debuted in Die Bad (2000). Now that he is in his thirties, he will show mature acting in Perfect Number . He has never cried in a film. I heard that even when he was acting for the scene he had to cry in Crying Fist (2005), he couldn’t produce tears, so he turned back and shook his shoulders. In the last scene of Perfect Number , I told him, “This is where you have to shed tears.”, he only imitated the facial expression by frowning. Then I said to him, “You have to cry with your heart, not with the face.” and his acting changed. -Seok-go and Hwa-seon exchange their emotions but unfortunately pass by each other at the last scene. I find it very plain and unique at the same time. I thought very hard to decide what sort of ending I should end up with. After much thought on many endings with different feel, my final decision was to have them tragically share their emotions without excessively outpouring them. I thought it would the best way to satisfy expectations of their relationship from the spectators. -You used to be an actress for a long time before directing Princess Aurora . Do you want to go back? -As a director, what kind of film do you want to make? The next film I’m preparing is The Way Home (Ji-beu-ro Ga-neun Gil). It’s a story of an ordinary housewife falsely accused of trafficking drugs and imprisoned at jail in France. I have always been interested in bread winning women. They have no choice but to be active to survive. Sun-jeong in Princess Aurora, Hwa-seon in Perfect Number and the housewife in The Way Home (Ji-beuro Ga-neun Gil) are all examples of them. I want to deal more with the story that develops as they struggle with life and society, as honestly as possible. The story is based on ‘The Devotion of Suspect X’ a Japanese mystery novel written by HIGASHINO Keigo. ‘The Devotion of Suspect X’ was once filmed in Japan in 2008. Here is the storyline of the original novel. Yasuko one day fortuitously kills her ex-husband, who has persistently tormented her. Then Ishigami, a neighbor who has secretly fallen for her, volunteers to help her out. perfect alibis and Yugawa chasing truths. However, PANG zoomed in the heartbreaking relationship between an intelligently gifted but lonely man Seok-go (RYOO Seung-bum) and a woman suffering great harship Hwa-seon (LEE Yo-won). PANG’s second film Perfect Number after her debut film as a director Princess Aurora (2005) is a romantic story although it looks like a mystery film.